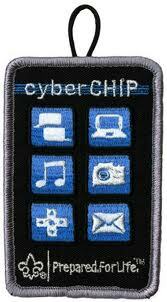 NOTE: The BSA Cyber Chip blue card and green card are available from BSA Scout Shops and Trading posts. I will tell my trusted adult if anything makes me feel sad, scared, confused, or uncomfortable. I will ask my trusted adult before posting photos or sharing information like my name, address, current locations, or phone number. I won't meet face-to-face with anyone I meet in the digital world. I will respect the online property of others. II will always use good "netiquette" and not be rude or mean online.